Considering buying a fast food pizza franchise? The following information on differences between a Domino's Pizza Franchise and a Pizza Hut Franchise reveals the scoop on each, and reveals pros and cons that can help you make a decision about which suits you better. Pizza Hut started with brothers Frank and Dan Carney borrowing $600 from their mom to start a pizzeria in Wichita, Kansas. In 1958, the first Pizza Hut opened its doors; the first Pizza Hut franchise opened in 1960 in Topeka, Kansas. Today, Pizza Hut has locations throughout the world, with over 7,000 U.S. franchises, over 5,900 franchises outside the U.S., and over 2,300 company-owned locations. Pizza Hut products include pizza, pasta, wings, breadsticks, other sides, and desserts. Pizza Hut is owned by Yum! Brands, the parent company of KFC and Taco Bell. If you have a budget of between $1.3 million to $3 million and a net worth of $700,000 with $350,000 in liquid assets, you can be in business within a year, but there are other requirements as well. You must commit to building at least 3 restaurants over 3 years. Pizza Hut's franchisee qualification and approval process takes 9-12 weeks, followed by 7-21 weeks for market selection and approval, then 18-36 weeks for construction and training. Pizza Hut is part of an organization that offers tremendous franchise support including advertising, business coaching, training, development, and cooperative sourcing. Performance Improvement Programs and support are also offered to each new franchisee, along with 8-10 weeks of required training conducted in a certified training restaurant in Dallas, TX. Pizza Hut does not provide financing; however, they do provide a list of banks/financing institutions that have expressed an interest in lending to Pizza Hut franchisees. To facilitate financing, Pizza Hut is listed on the SBA registry. Brothers Tom and James Monaghan borrowed $500 in 1960 to purchase DomiNick's, a pizza store in Ypsilanti, Michigan. In 1961 James traded his half of the business to Tom in exchange for a Volkswagen Beetle. In 1965 Tom Monaghan renamed the company Domino's Pizza LLC; the first Domino's Pizza franchise opened in Ypsilanti, Michigan, in 1967. Tom Monaghan retired in 1998, selling 93 percent of the company to Bain Capital. On top of regular, thin crust and pan pizzas, Domino's products include sandwiches, pasta, bread, desserts, buffalo wings and specialty chicken dishes. Domino's operates more than 6,000 stores in the United States, Canada, Europe, and Africa. Franchisees at Domino's Pizza fall into one of two categories: internal or external. Internal franchisees have already worked within Domino's as a General Manager for at least one year. 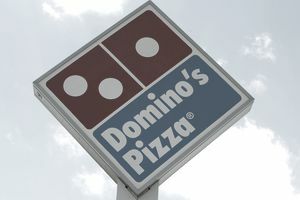 External franchisees have not previously worked with Domino's as a General Manager, but do bring outside business or other management experience to the table. For the first group, the franchise fee is $0 to $25,000 depending on the social segment (woman, minorities, veterans). For External franchisees, the fee is set at $25,000. Domino's Pizza offers a comprehensive training program covering store operations, marketing, finance, and human resources. Training consists of a five-day Franchise Development Program and four-days of Pizza Prep School. The Domino's economic model is built on strong cash-on-cash returns. Their technology platform enables online ordering, direct email marketing, cost controls and store management. Their supply chain is designed to ensure quality, leverage purchasing power, and give back to the franchise owners with a profit-sharing program. Domino's provides in-store and classroom training for all new franchise owners.